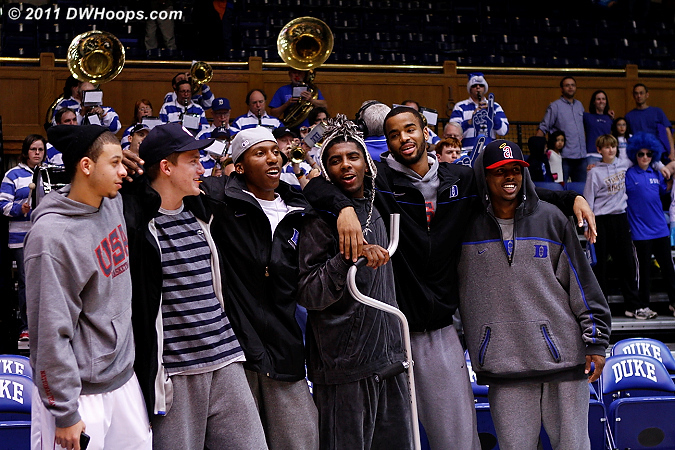 DWHoops is proud to present the largest captioned Duke photo galleries on the internet. 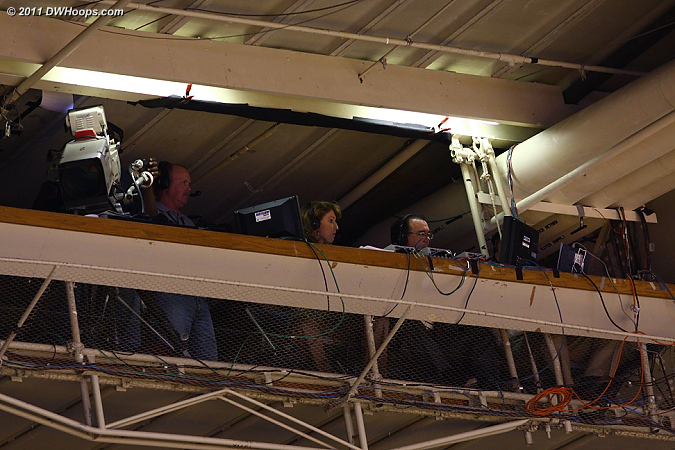 But, we can't do it without your help. Please consider becoming a DWHoops member today! 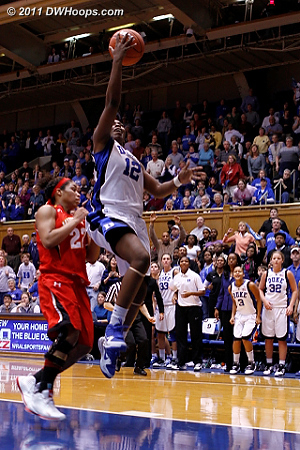 Jasmine Thomas scored Duke's second basket for a 4-0 lead. 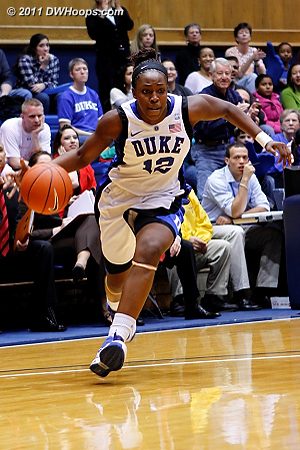 Krystal Thomas, "Doing the dirty work in the paint." 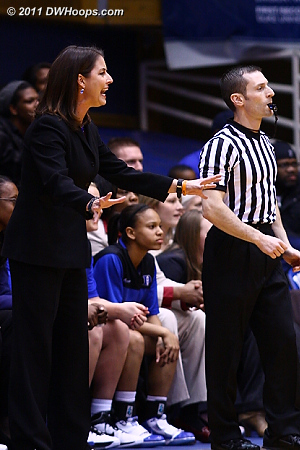 Coach P looks for Duke to settle down as referee Joseph Vaszily watches play continue. 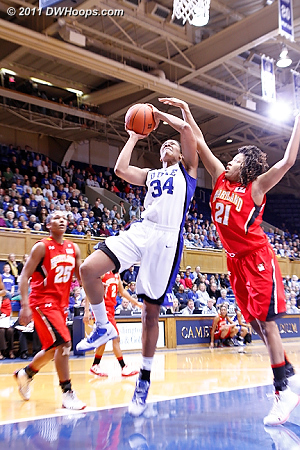 The rebounding battle was pretty even in the first half. 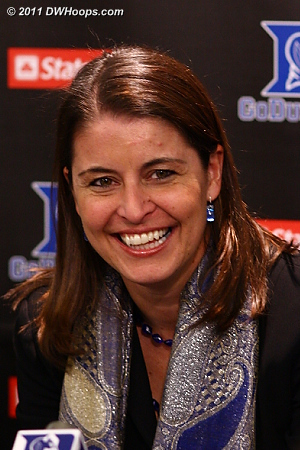 After an 0-4 night vs. Kentucky Krystal was a much more respectable 4-7 from the field. 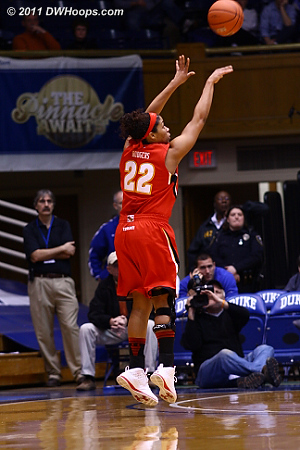 Kim Rodgers scored three of the Terps four three pointers, including back to back bombs that put them up 20-13. 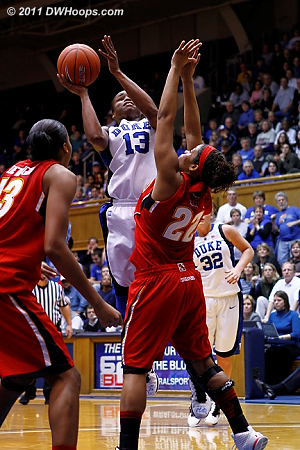 Krystal Thomas ends the 14-0 Maryland run by getting past Tianna Hawkins for a layup. 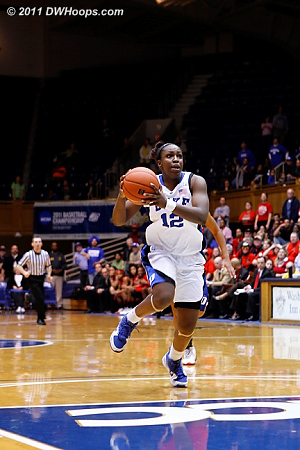 Tricia Liston leads the Duke fast break as Diandra Tchatchouang gives chase. 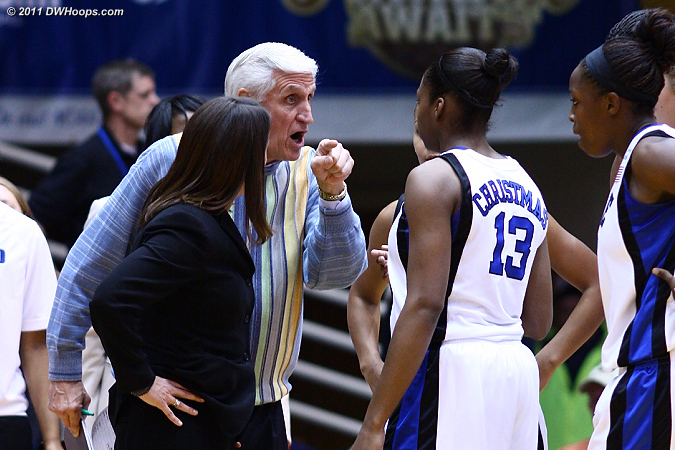 More words for Joseph Vaszily as Coach P rode the refs regarding physical play against Christmas. 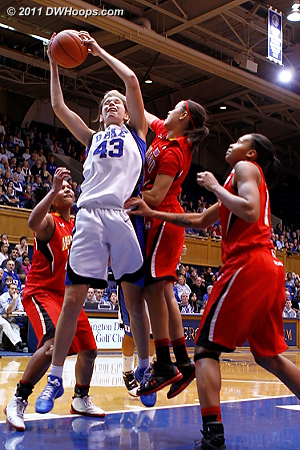 Allison Vernerey grabs an offensive rebound. 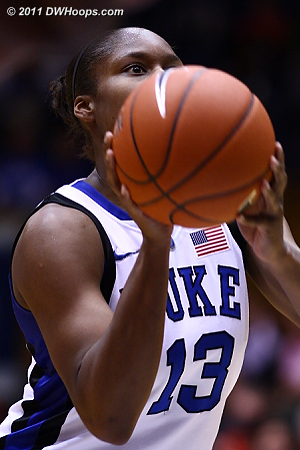 Liston ends a three minute Duke drought by swishing this trey, Duke trails 27-25. 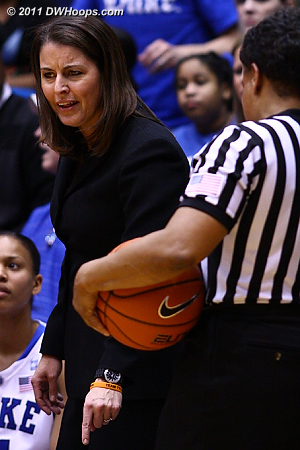 Liston credits the assist to Chelsea Gray. "Hey, I really like this song!" 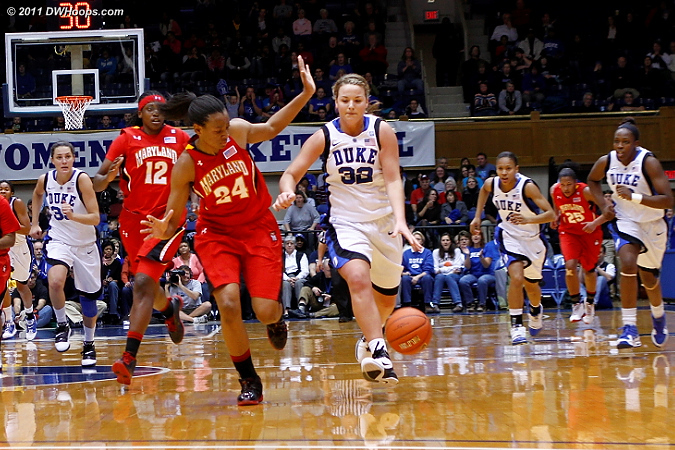 Tricia Liston readies a wide open three point attempt as Coach Frese calls for Maryland defense. 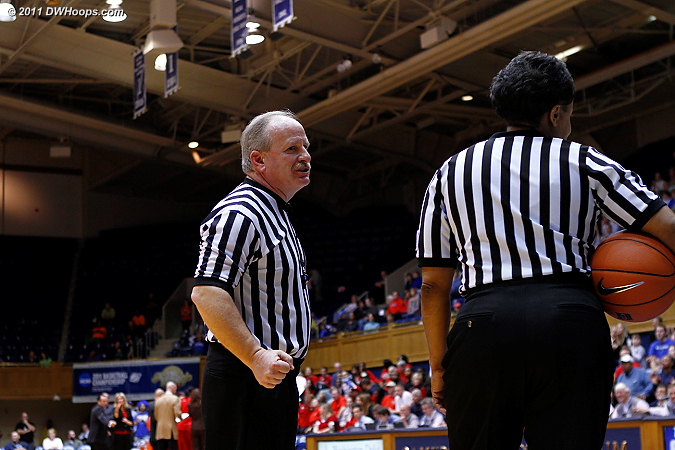 Liston on the stripe, again drawing Duke to within two. 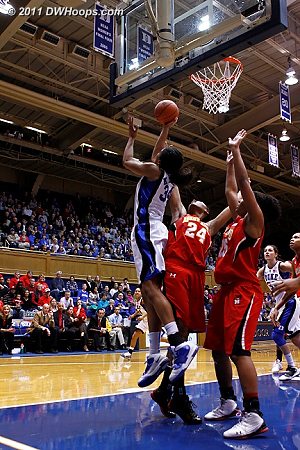 Alyssa Thomas walked before this shot. 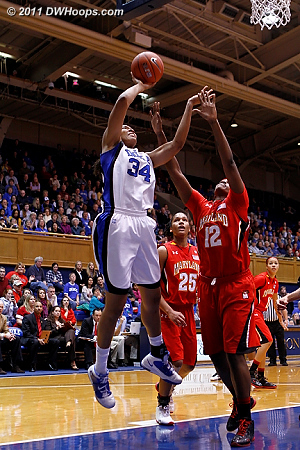 With .8 seconds left in the first half, Maryland inbounded the ball to Lynetta Kizer and she made Duke pay. 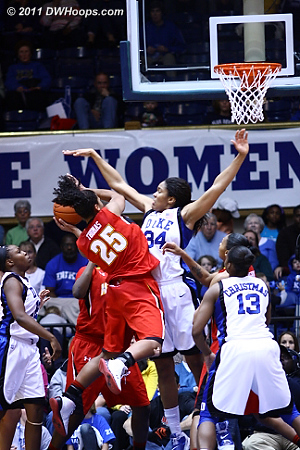 33-29 Terps at the break. 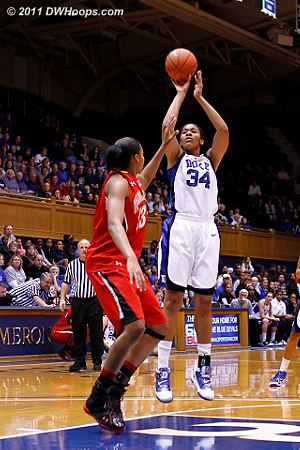 Jas ties it up at 33. 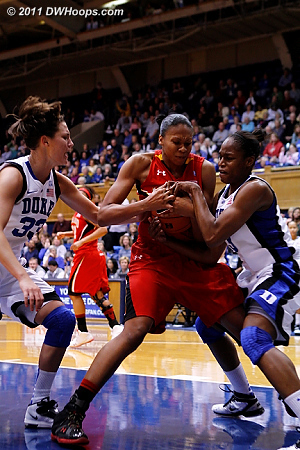 Diandra Tchatchouang loses the ball out of bounds. 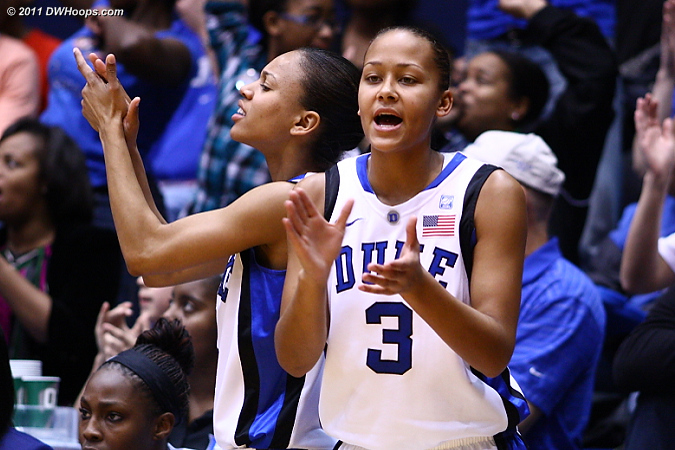 Support from Chloe Wells (left) and Shay Selby on the Duke bench. 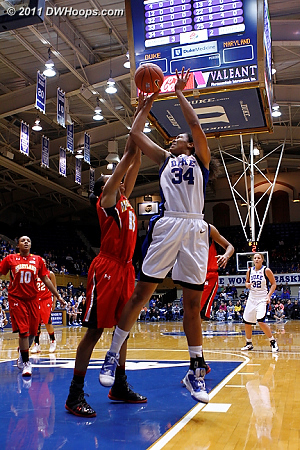 This isn't a block for Krystal -- Kizer had just been fouled by Peters. 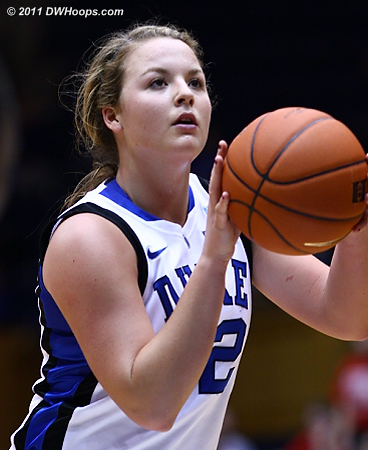 Haley on the stripe, pulling Duke to within one. 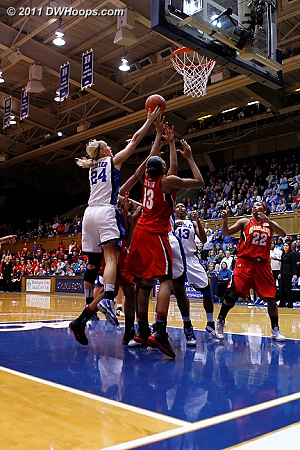 Haley Peters steps in to draw a charge from Kim Rodgers. 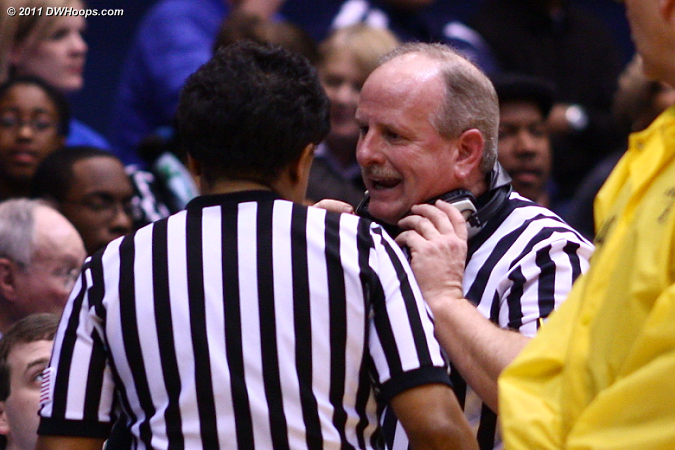 Veteran official Lawson Newton during a break in the action. 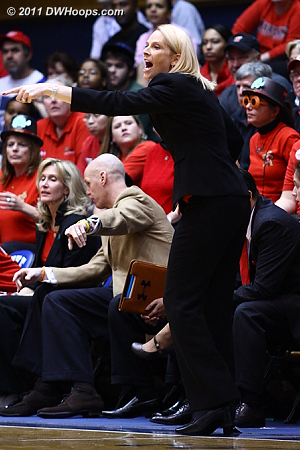 Coach Frese directs her offense. 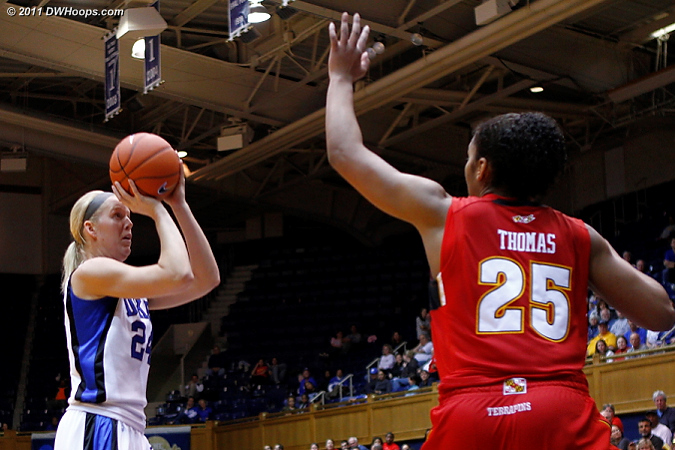 The Thomas layup puts Duke up 39-38, their first lead of the second half. 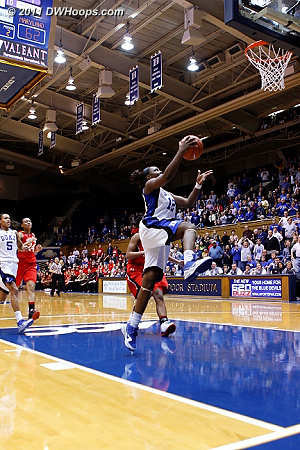 Making some baskets gave Duke more opportunities to press and trap. 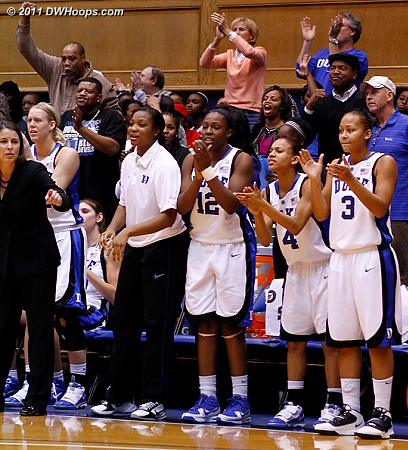 The Duke bench and fans, including Mike Currie to the upper left, applaud a Karima Christmas steal. 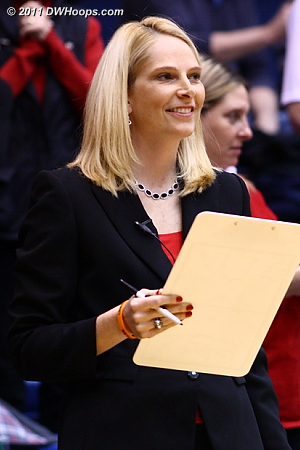 DWHoops distributed hundreds of orange wristbands imprinted with "TEAM TYLER - Leukemia Awareness" before the game. 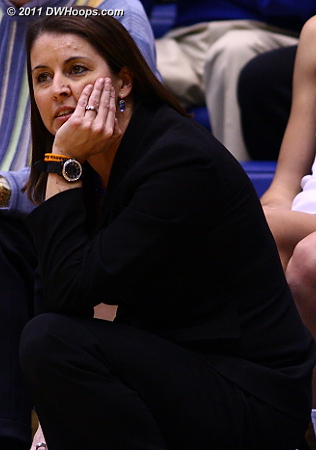 Coach Frese's son Tyler was diagnosed with leukemia last fall. 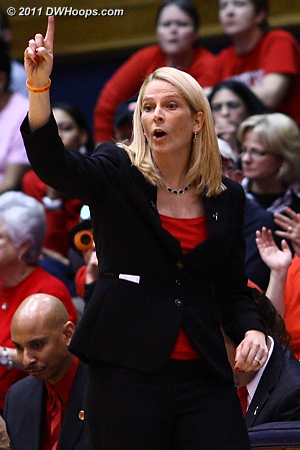 Both coaching staffs wore the wristbands during the televised game. 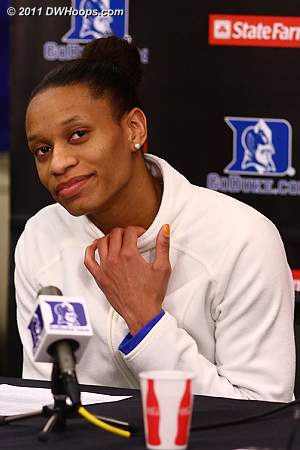 This time it's words for Bonita Spence. 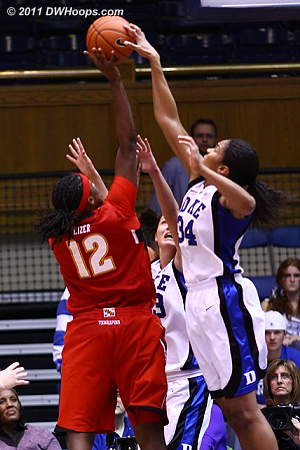 With Duke leading 41-38, Kim Rodgers hoists a three pointer as the Maryland reserves provide encouragement. It didn't go. 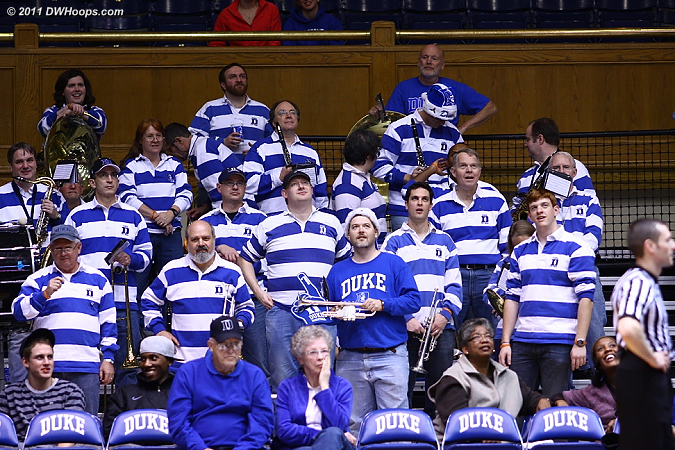 Hooray for the Duke Alumni Band - great job tonight! 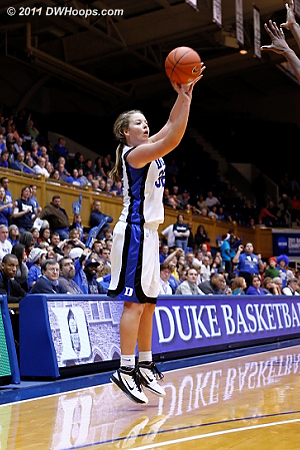 Kathleen Scheer hit a nice midrange jumper for a 43-40 Duke lead. 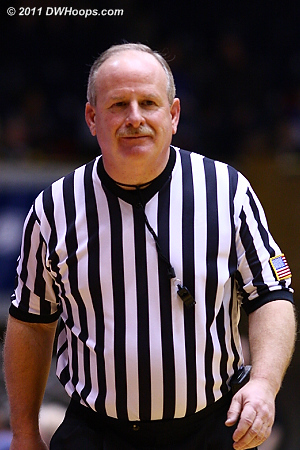 Herb "Crazy Towel Guy" Neubauer asks the refs for a traveling call. 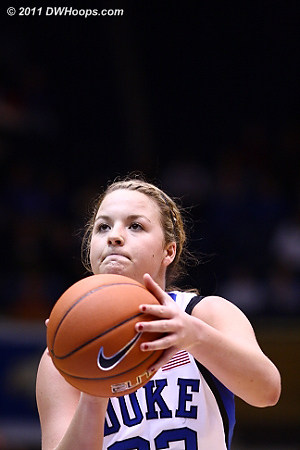 Another trey from Liston breaks a 43-43 tie. 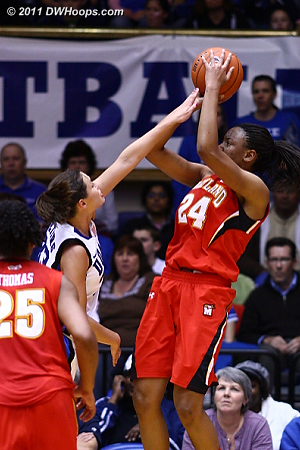 Maryland answered with a three from Rodgers, tied at 46. 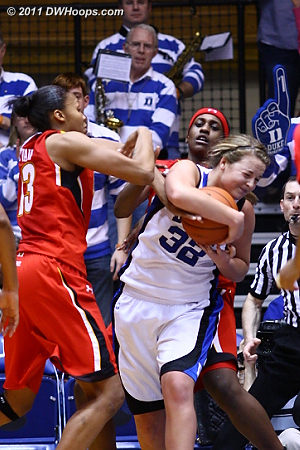 This was not a foul, but Duke did maintain possession. 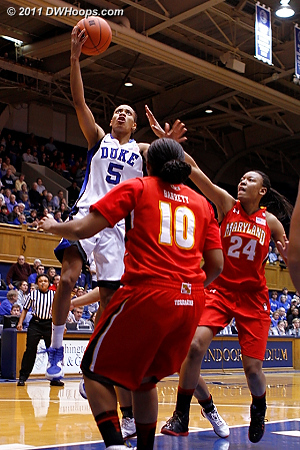 Good D from Duke made the Terps come up empty on a four shot possession. 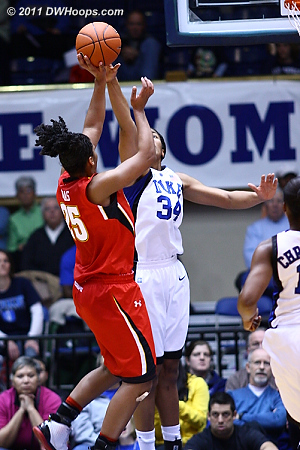 With the inside clogged, Kizer stepped outside to hit this jumper, 50-48 Duke. 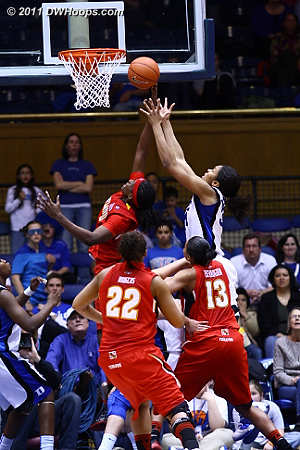 Karima Christmas draws a foul from Anjale Barrett. 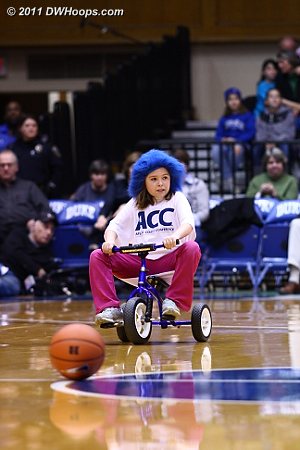 Christmas on the line, she missed the front end but Duke got the carom. 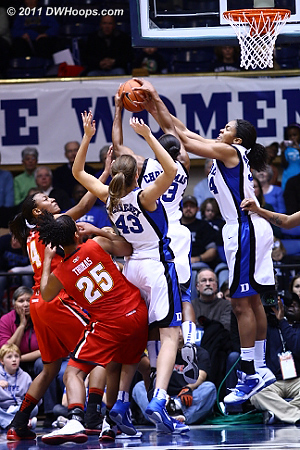 The Duke possession ended with a held ball. 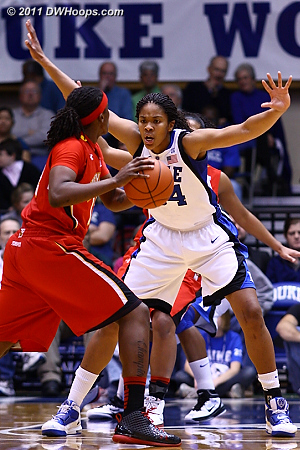 Jas goes into attack mode. 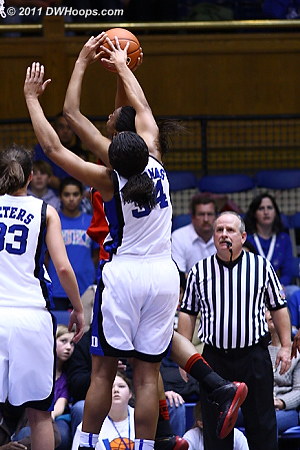 With too much body on this one, Krystal gets her second foul of the game. 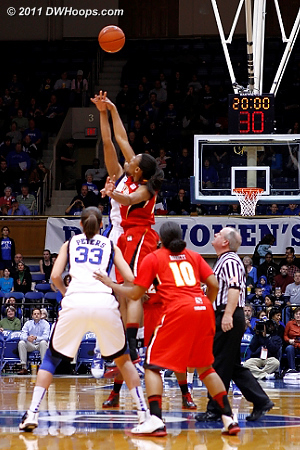 Maryland could have taken the lead, but consecutive misses from Tchatchouang left it knotted at 50. 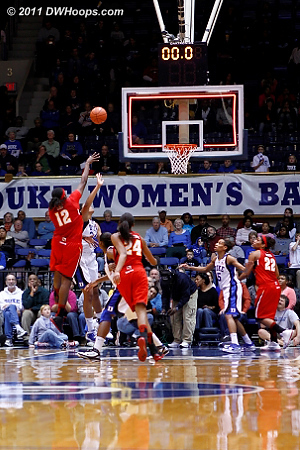 Liston threads the needle to put the Devils up 52-50. 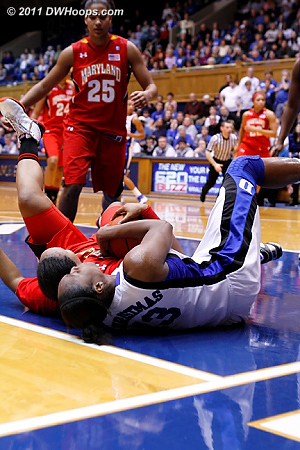 This is not a foul. Solid defense from Scheer results in a bad Kizer miss. Barrett can't stick back the Kizer miss. 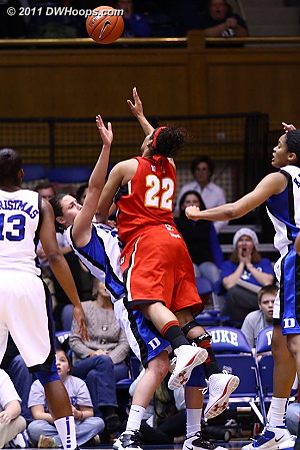 After another fruitless Maryland try, Liston grabs the rebound and is fouled. 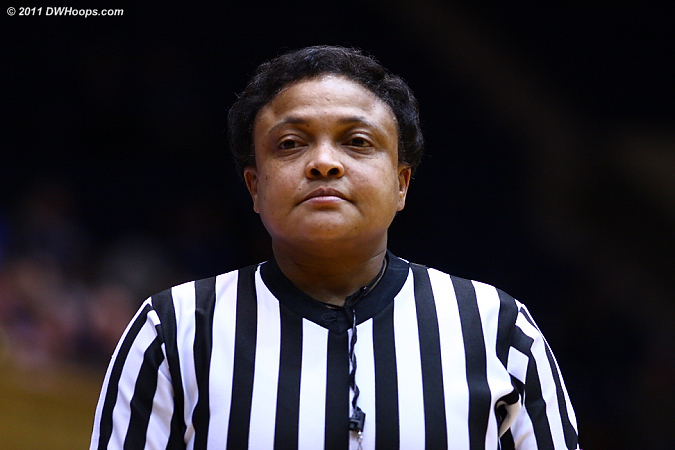 Liston on the stripe with a chance to tie the game. 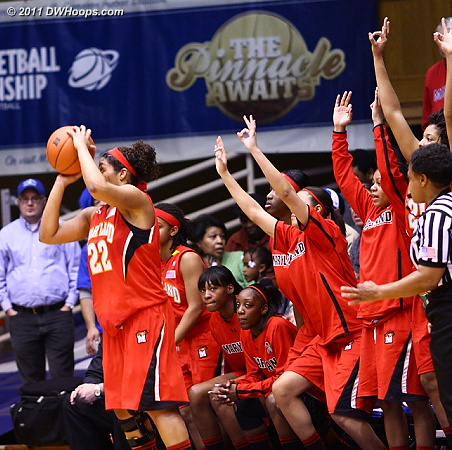 Tricia made both free throws for a 54-54 tie. 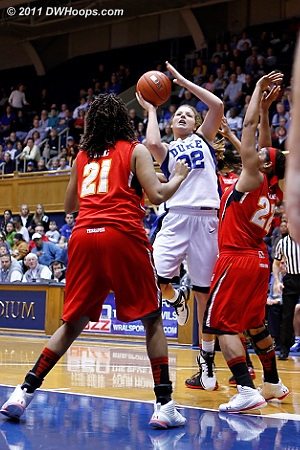 Kathleen Scheer tries to rebound her own miss. 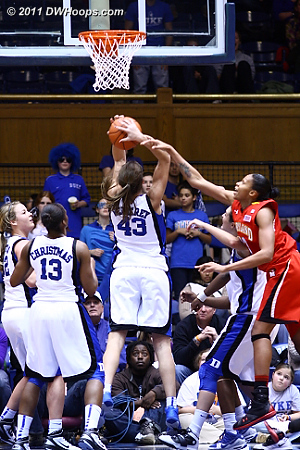 Karima draws a foul from Tchatchouang. 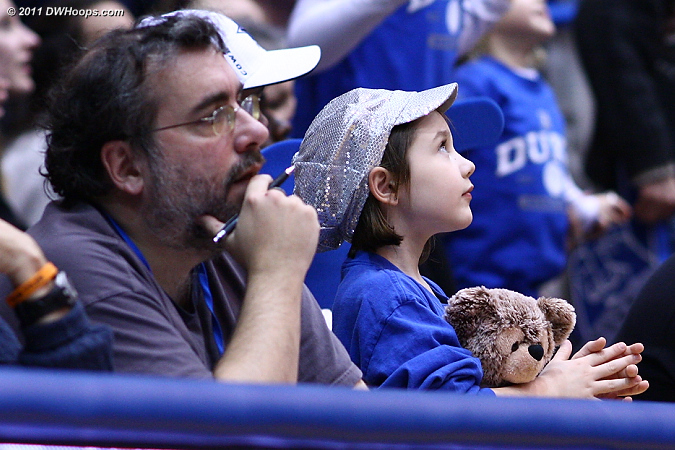 DWHoops Rob Clough has been joined on press row by a "cub reporter"
"The Thinker" - DWB style. 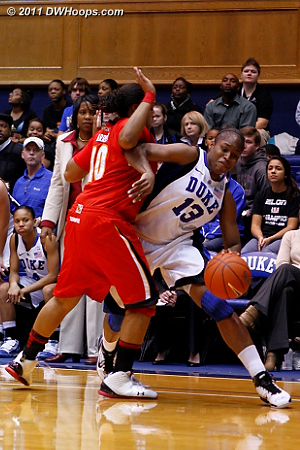 Lawson Newton demonstrates an elbow to Bonita Spence. 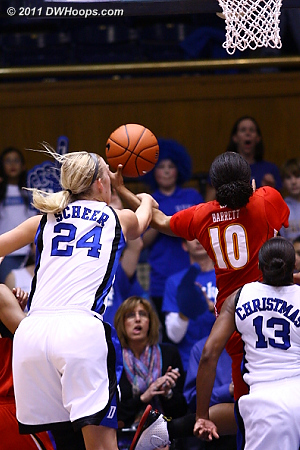 Christmas and Barrett wrap it up, arrow gives the ball to the Terps. 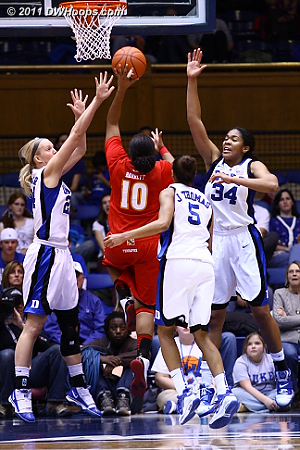 Krystal Thomas strips Tchatchouang for a Duke steal. 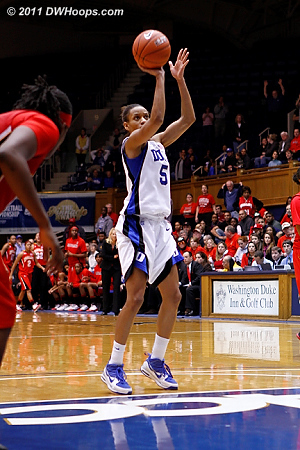 On the Heels of a three pointer that put Duke back in the lead, Jasmine Thomas hits an extremely difficult shot for a 63-60 Duke advantage, 1:10 remaining. 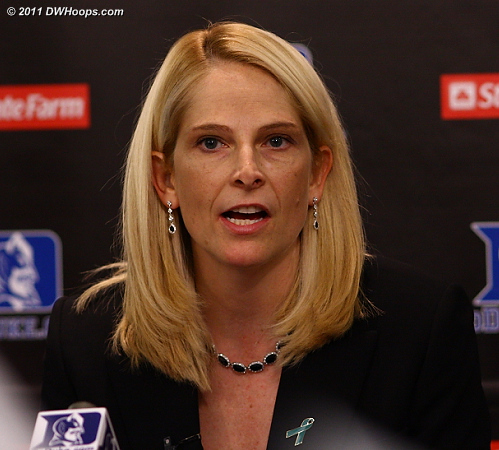 Chelsea Gray turns over Kim Rodgers with 54 ticks left. 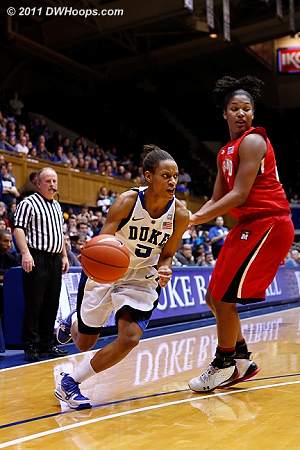 Chelsea Gray goes coast-to-coast and Duke leads 65-60. 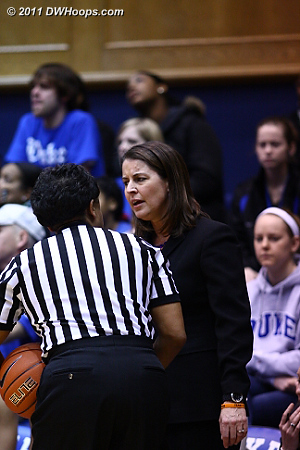 Maryland calls timeout and Shay has the good word for Jas. 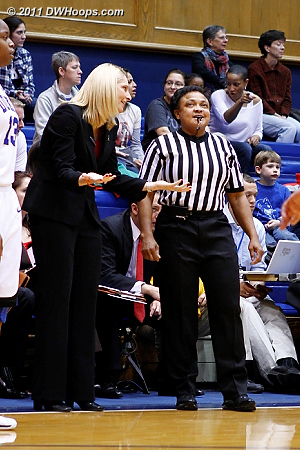 "Do you wait until the last two minutes on purpose?" 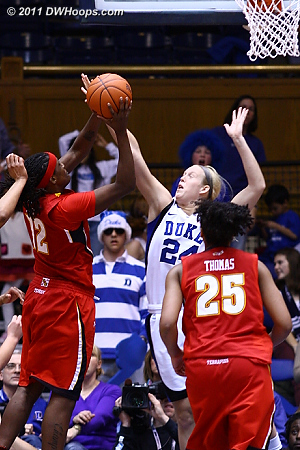 With 44 seconds left and Duke up 65-60, Kathleen Scheer fouls Anjale Barrett. 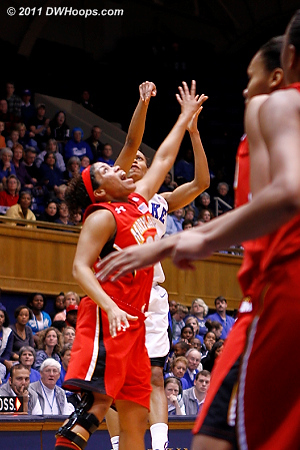 Maryland was forced to foul immediately and Jasmine Thomas was money. 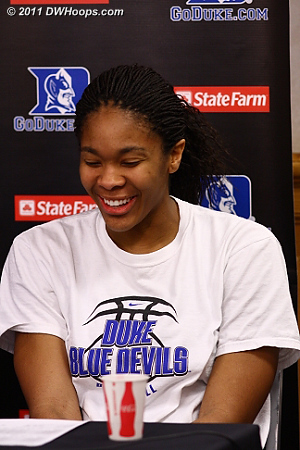 67-62 Duke. 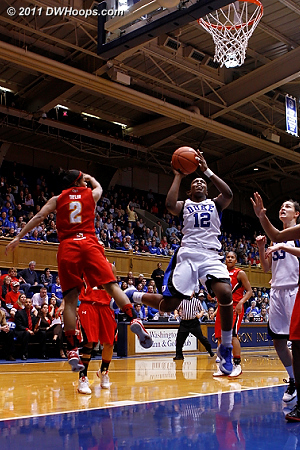 Duke defense swarms Anjale Barrett. 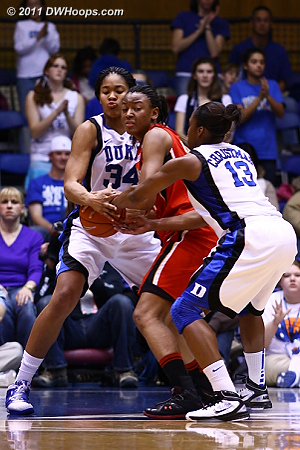 Chelsea Gray pokes the ball between Anjale Barrett's legs. 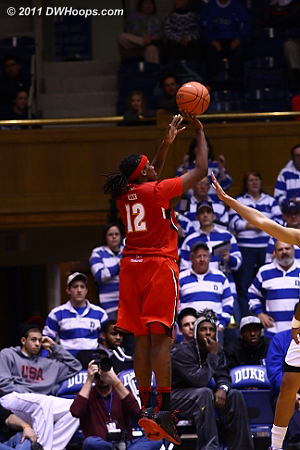 In the last two minutes it's no surprise that the ball went right to Jasmine Thomas. 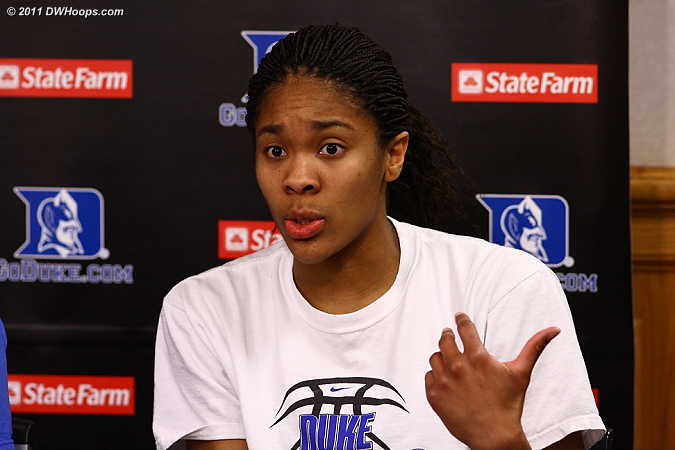 Jas found a wide open Chelsea Gray streaking to the hoop. 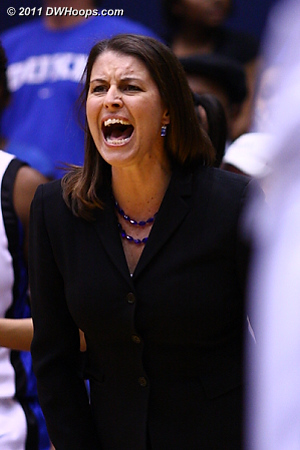 Chelsea makes it 69-62 Blue Devils with half a minute left. 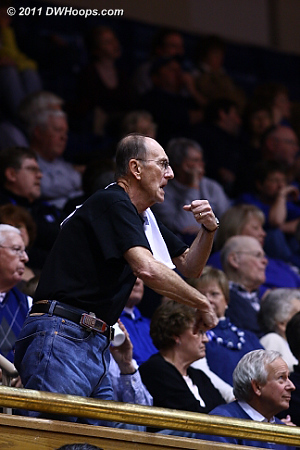 More than just the ladies can sway to "Dear Old Duke" - thanks guys for your enthusiasm and support! 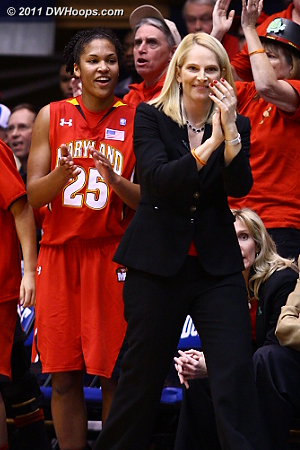 Maryland Head Coach Brenda Frese in the media room. 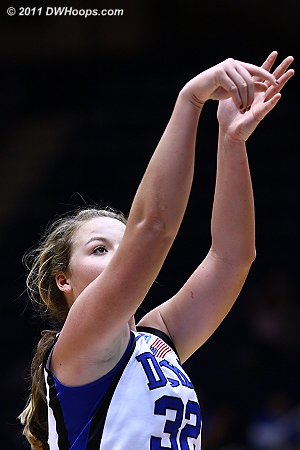 Tricia Liston had twelve points, all of them timely scores. 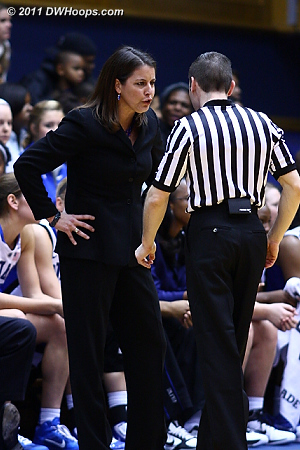 "Unfortunately you don't want to have to wait until the end of the game to be at your most intense state." 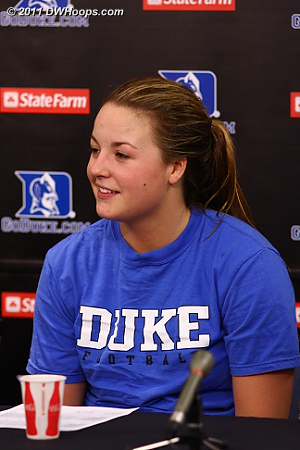 Krystal Thomas asked about "doing the dirty work inside"
Coach P's Blue Devils are a perfect 15-0 with eight days to recover. 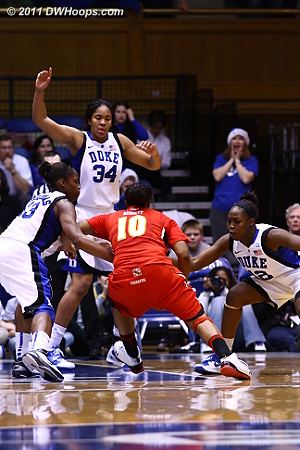 Next game is a trip Florida State on Friday the 14th. 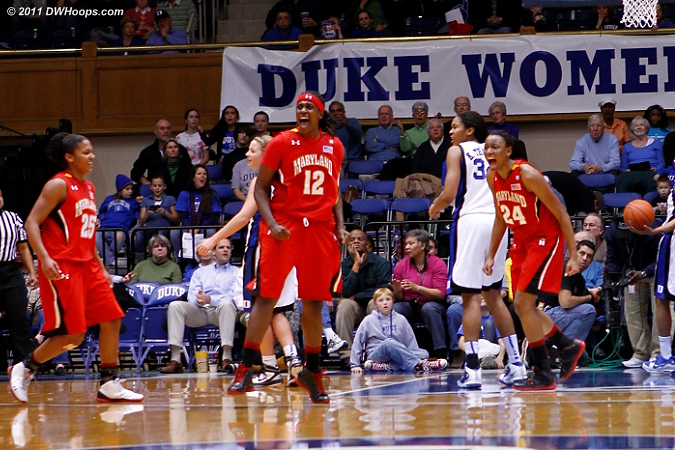 "Maryland is big. 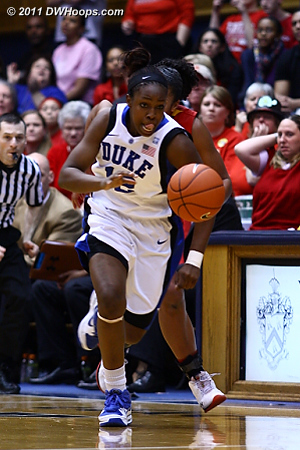 I knew I had defensive responsibilities to take care of and so it was another challenge in front of me, and I had to produce for my team."